Experience the thrill and excitement of the velodrome with a fast-paced track cycling experience in London - a must-try for any avid biking fanatic! Perfect for both beginners and seasoned road racers, this exciting session teaches a host of essential track cycling techniques on Hearne Hill's iconic velodrome. Pick up tips and skills from bonafide British Cycling track coaches, before putting new skills to the test on the challenging banked oval track. 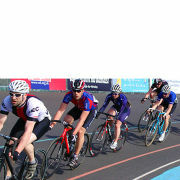 Take part in a series of competitive races including a team challenge, sprint and individual pursuit, then negotiate your way around every bend of the velodrome in a bid to become champion. To finish, the top racers of the day get prizes in an official awards ceremony. On your marks, get set, go!